Load up and hit the dirt road. Your guide to your best western hunting adventure yet! Route 66 may be the Mother Road, but America’s Interstates are the hunter’s highways. Each fall they guide sportsmen from East to West, funneling truckloads of people and gear into the Rocky Mountains and beyond. For some, these trips are annual excursions, for others it’s their first, addictive taste of what hunting the West is all about: freedom, fun, and a big-game adventure like no other. Here’s how to plan and execute your own Great American Road Trip. Saying the West is big country is understating the obvious. There is a lot of land out here and plenty of places to hunt, but dialing it down to a specific spot is nearly impossible. To help you out, we’ve picked five of our favorite places. Though the terrain is tough and the grizzlies abundant, the Bob Marshall Wilderness Complex is a bucket-list hunting destination. Seeley Lake up to Condon serves as a gateway to “The Bob’s” backcountry, with several trails leading into the most ruggedly wild country in the Lower 48. It’s a fact. There are more antelope in Wyoming than people, which means high-success hunting for the prairie’s pronghorn. While there may be better areas of the state for trophy potential, many of the units around Casper offer the perfect mix of tag availability and access. The northwest corner of Colorado is the home to the White River elk herd. Up to 40,000 animals strong, it’s the largest concentration of elk in the world. The area is also one of the last, best places in the West when it comes to over-the-counter license availability. That makes it popular, so expect a crowd. Depending on the species you’re after, there are great opportunities all over Idaho. But staying around Stanley puts you in the heart of it all, with access to the imposing Sawtooth Range and some excellent elk and mule deer hunting. Do your research and get in shape, as this country is as tough as it comes. Without a preference points system, applying for elk in New Mexico may feel like a lottery. Should you draw a tag,expect a Master’s Class in elk hunting. Elk numbers are strong and the country is beautiful, but it’s the chance at a 350+ bull that keeps us applying every year. Outfitted hunts for this iconic mountain species are out of reach for most hunters, but limited-entry tags offer an affordable option. However, it can take 20 or more years to draw. The last, great DIY hunt. 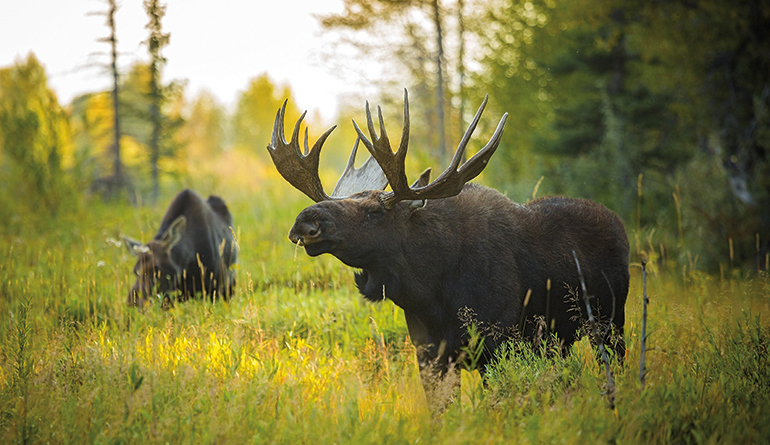 Float a wild river through the most remote country in America, sending the lustful call of a cow moose into the willows in hopes of bringing a 1,200-pound behemoth into range. Ranch buffalo hunts are a great way to make meat, but for a true frontier experience, put in for a wild bison hunt in Utah or Wyoming. For the first time in 40 years, you can face off against Ol’ Ephraim in the Lower 48. Idaho and Wyoming currently offer opportunities to draw a tag in the Greater Yellowstone Ecosystem. Perhaps the most difficult, most dangerous mountain hunt, but a snow white billy is worth the risk and expense. What is the difference between state lands and federal public lands? Federal public lands are U.S. Forest Service (USFS), Bureau of Land Management (BLM), and U.S. Fish and Wildlife Service (USFWS) —these lands are yours to access for recreation and hunting. Like federal public lands, there is a range of state lands, which include state wildlife areas, state parks, and state trust lands. Can you hunt National Parks and Monuments? There are a good number of units managed by the National Park Service that do allow hunting, such as National Seashores, National Preserves, and National Recreation Areas. As for National Monuments, hunting is generally allowed in most National Monuments that are managed as part of the BLM’s National Conservation Lands program or by the USFS. Can I use a private lands tag on public lands?Some states, such as Utah, New Mexico, and Colorado have ‘transferable’ private land tag systems by which a landowner is allocated a certain number of tags based on the amount of land they own. That landowner can then sell the tag to hunters who can indeed use that tag to hunt public lands within the unit that said landowner lives. Can we camp here? Can we have a fire here? USFS and BLM lands have few restrictions with camping and attended campfires (depending on the current fire conditions). State lands tend to be much more restrictive on where or if you can camp or have a campfire. Consult your local land management agency for regulations. What’s the difference between BLM lands and USFS lands? BLM lands are managed by the BLM under the Department of the Interior. USFS lands are managed by the USFS under the Department of Agriculture. Are state lands considered public land and can I hunt them? In some states, such as California, Oregon, and Washington, they are considered open unless closed, whereas access varies greatly in other states. In many states, sportsmen pay an annual lease to the state land board in return for public recreational access. Some states lease out recreational access on state trust lands to the highest bidder. Can I cross private land to access public land? No, not without permission from the land owner. It is best to have a written agreement that you and the landowner sign. How do I know what roads and trails are open to motorized use? The USFS and BLM have travel management plans in place where roads and trails exist within their managed areas. Consult these plans to learn about motorized use. 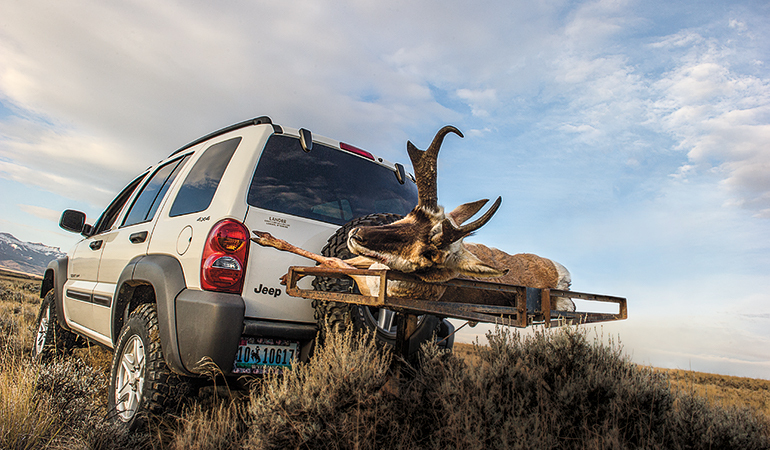 Can I use an ATV to retrieve a big-game animal on public lands? If the road or trail is open to motorized use, then yes. However, most areas off motorized travel routes are closed to game retrieval with an ATV. It is always best to consult your fish and game department along with the land management agency to ensure laws and regulations. What is corner crossing? Is it legal? This occurs where public and private lands come together in a checkerboard pattern. The legality of crossing the corner varies by state. What is a walk-in area? Walk-in areas are generally private lands open to public access and hunting through cooperative agreements with land management and fish and game management agencies. This extensive mapping system can be used on your computer, tablet, smartphone, or Garmin GPS unit. It shows you 985 million acres of public land, 121 million private property listings with contact information, and over 400,000 miles of trails. Plan your trip from your screen and save the maps to your smartphone. Best part? Even if you have no cell service, the GPS in your smartphone works offline, so you can locate yourself from your saved onX maps. “Google it!” This mapping system is a hidden gem that you didn’t realize you had—and it’s free. Simply change the map to “satellite” mode and you’ve just unlocked the perfect terrain scouting system. Roads, rivers, streams, forests, mountains, and more can be seen easily. Zoom in or out to help you scout the location you plan to hunt. When you think you have the perfect location, it will even give you directions to help you drive as far as possible. Most states have caught up with the times and now offer hunt planners directly on their Division of Wildlife websites. This is to aid you in finding hunting land and in staying in your legal unit. Use it to your advantage to easily locate territories to hunt, campsites, trails, and to scout locations for your best bet at filling your tag. 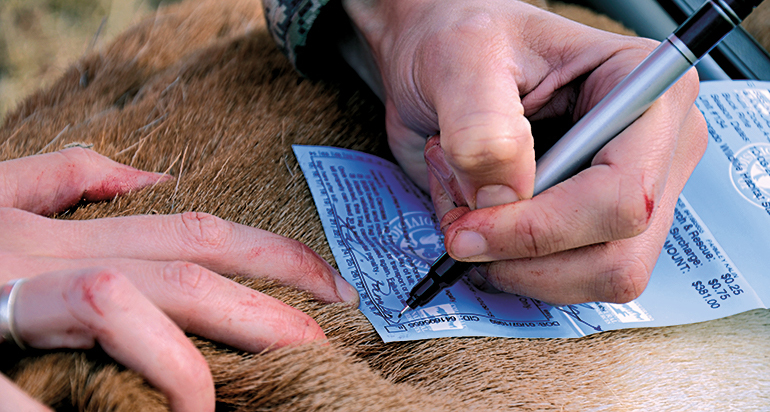 Over-the-counter licenses are the everyman’s ticket to hunting big game in the West. They’re a great way to get into the backcountry without waiting years to draw a limited-entry tag. But units that require drawing a tag often offer an overall better hunting experience, with less hunters on the ground and increased opportunities for a true trophy. Here’s what you need to know. Think of these as raffle tickets. For every bonus point you have, one ticket goes into the draw. The more bonus points, the better the odds of drawing, but the beauty of a bonus-point system is there is a chance you could draw that tag-of-a-lifetime the very first time you apply. The downside, if you could call it one, is you might draw a tag you weren’t expecting and have to rearrange your fall plans on the fly. Instead of giving you multiple chances at drawing, the preference-point system puts you into a pool of applicants. You get a point each year you apply, and some states offer the opportunity to buy extra points. You need a maximum number of points to draw that particular unit, with no chance of drawing a license without that set number of points. On the plus side, you generally know the year you’re going to draw, so you can be prepared for the hunt of a lifetime. A backpack hunt that takes you deep into the wilderness is a dream of many hunters. But countless go in with unnecessary gear, or worse, some go in with not enough. Here’s the must-have gear for a three-day backcountry trip. Pack: A 3,200- to 5,500-liter pack is perfect for a three-day hunt. Go with a pack that has an external frame and a meat-hauling shelf. Sleeping Bag: Spend the money on a high-quality down sleeping bag rated to at least 10 degrees under the temperatures you’ll be sleeping in. Down sleeping bags pack down small and provide extra insulation. Sleeping Pad/Cot: Buy a quality inflatable sleeping pad like those from Klymit or a lightweight cot such as the Therm-a-Rest UltraLite Cot. Portable Stove: Go with a system like the JetBoil Flash or Camp Chef Stryker that packs fuel canister, burner, and pot into one convenient package. To save weight, pack a single stove for two hunters. Water Purification: The Sawyer Mini Filter screws directly onto your water bottle and costs only $25—and it works like a charm. The Grayl Ultralight Water Purifier Bottle purifies water directly in its bottle and costs only $60. Food: Mountain House and Backpacker’s Pantry are popular dehydrated food options. Try them before you go! Choose high-calorie snacks such as trail mix, protein bars, and jerky. Miscellaneous Gear: Headlamp and a set of extra batteries; a sharp knife; paracord; a baggie of tinder; two Bic lighters; baby wipes; traveling toothbrush and toothpaste; plastic grocery bag for trash; game bags; and solar panel to keep your electronics charged. Communication & Navigation: Don’t rely on smoke signals to phone home. The new Garmin inReach Mini pairs with your smartphone and allows you to text loved ones. It also has GPS capabilities when you download its Earthmate app. First Aid/Safety Kit: Carry a basic First Aid kit with gauze, tourniquet, Band-Aids, alcohol wipes, antibiotic ointment, Ibuprofen, and Benadryl. For safety, pack a lightweight safety blanket, iodine pills, and a fire starter.